How is Prometheus like both Satan and Christ? What is a "gothic novel"? Explain: "My husband . . . was, from the first, very anxious that I should prove myself worthy of my parentage, and enrol myself on the page of fame" (187). Explain the significance of the dream Shelley describes on March 19th. According to the Preface, what is the author's chief concern in writing Frankenstein? How does Walton compare with the Ancient Mariner? Why is Walton going to the North Pole? How do his motives compare with those of the mariners in Coleridge's poem? Why does Victor get into Agrippa? Why isn't his father successful at first in persuading him to stop reading him? How does his father get him to stop? Why does Victor refer to his laboratory as a "workshop of filthy creation" (38)? Explain the significance of the dream Victor has on the night of his "success." What is the nature of Victor's illness? Why does it fatigue him, even after several months recovery time, to write a letter? When Victor says, "The mere presence of the idea was an irresistible proof of the fact"(53), to what is he referring? What does he mean? Why does Victor call the creature "my own vampire, my own spirit released from the grave"(53)? What does that mean? In what ways was Mary Shelley's life with Percy Shelley "tempestuous"? In what ways is Frankenstein "a vibrant intersection of interlocking cultural concerns" (xix)? 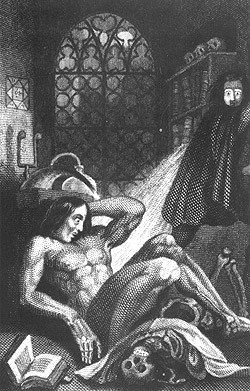 Why did Mary Shelley have reservations about writing an Introduction to Frankenstein? Why did she decide to do it? Explain: "Invention, it must be humbly admitted, does not consist in creating out of void, but out of chaos" (189). Why does she refer to her novel as "my hideous progeny" (191)? Who wrote this preface? Why is that significant? Why does Shelley distinguish this novel from "a mere tale of spectres or enchantment" (3)? When Victor says, "I was required to exchange chimeras of boundless grandeur for realities of little worth" (29), what does he mean? When Victor says, "To examine the causes of life, we must first have recourse to death"(32), what does he mean? Why is Victor so anxious about returning home? Describe the mood Shelley develops in her description of the setting of Geneva. Has Justine killed William? Why does she confess? Why do so many people "confess"?